Bayern Munich have signed Real Madrid midfielder Xabi Alonso from Real Madrid for an undisclosed fee on a two-year contract. The 32-year-old had been at Real for five years following his £30m move from Liverpool in 2009. The Spaniard, a Champions League winner in May, only signed a new two-year deal in January. Alonso announced his retirement from international football on Wednesday after 114 caps. "The club did not want me to go. It was my decision and I asked them to understand." 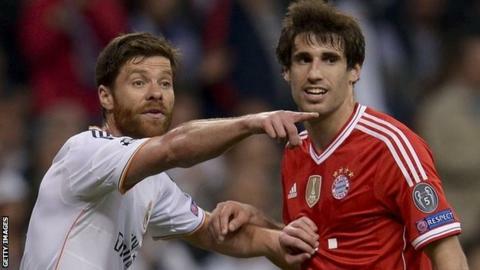 Bayern moved for the central midfielder after Toni Kroos joined Madrid after the World Cup and fellow Spaniard Javi Martinez was ruled out until 2015 with a knee injury. "He has bags of experience and a big personality," said Bayern boss Pep Guardiola. "We need a player with his quality and vision. I know he's 32 but that doesn't matter in this position, where you need intelligent players, rather than the legs and stamina for the flanks." Alonso said: "I had a great time here, we have won big things and now a new chapter opens for me. It was the hardest decision I've ever had to take. "The club did not want me to go. It was my decision and I asked them to understand. The club didn't share my idea but they understood my need to start a new chapter, to start from zero in a new club." Alonso, who won two European Championships and a World Cup with Spain, joined Liverpool from Real Sociedad in 2004 where he won the Champions League at the end of his first season.